From the ground up, every slide and every swing has been a labor of love for the Sandy Ground Project: Where Angels Play, because each of the playgrounds represents an angel from Sandy Hook Elementary School. “It makes me feel like a million dollars. It’s the best thing we’ve ever done,” said Bill Lavin, founder of The Sandy Ground Project. The project was both an effort to rebuild coastal communities in New York, New Jersey and Connecticut that were damaged by Superstorm Sandy and a way to honor the lives of the 20 children and six adults who were killed in Newtown last year. “We thought that too much focus was on the way these children left us. We wanted to celebrate who they were, their favorite colors, have their personalities reflected, and while doing that, have other children benefit,” said Lavin. 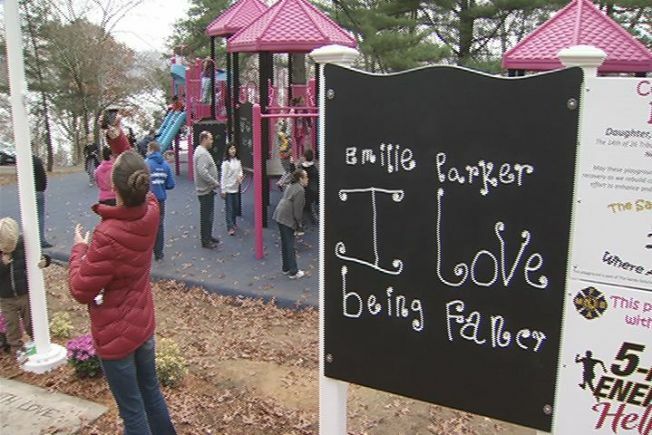 The playground in New London is built in honor of Emilie Parker. It has the special touches of Emilie’s drawings and her favorite colors of pink, black and blue. It’s a playground Emilie’s father says she would love. “She was someone who was all about community and love and making sure that everybody felt welcomed, so that’s what’s going to happen here,” said Robbie Parker, Emilie’s father. It will happen on all of the 26 playgrounds that are built. So far there are 15 completed, and the work is far from over. The playground dedicated to Josephine Gay was just completed this week in Bridgeport, and it couldn’t have come at a better time. “A great way to overcome the anniversary with a celebration of her life,” said Michele Gay, Josephine’s mother. “From something ugly that is happening, something beautiful is coming out of it,” said Carlos Soto, whose daughter, teacher Vicki Soto, lost her life in her classroom at Sandy Hook. Organizers feel the memory of the 26 angels will forever live on through these playgrounds, the passion of the volunteers who built them and the children who will be able to enjoy them every day. “I want parents when they come here with their kids to put their cell phones away and just really enjoy the pure joy that kids embrace and fill our lives with,” said Robbie Parker. “The gift of hope and giving and people coming together against all odds and in the wake of such horror, I think will live on for generations,” said Bill Lavin.